Can we know the risks we face, now or in the future? No, we cannot; but yes, we must act as if we do. Some dangers are unknown; others are known, but not by us because no one person can know everything. Most people cannot be aware of most dangers at most times. Hence, no one can calculate precisely the total risk to be faced. How, then, do people decide which risks to take and which to ignore? On what basis are certain dangers guarded against and others relegated to secondary status? This book explores how we decide what risks to take and which to ignore, both as individuals and as a culture. 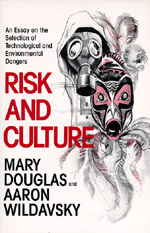 Dame Mary Douglas, DBE, FBA (25 March 1921 – 16 May 2007) was a British anthropologist, known for her writings on human culture and symbolism, whose area of speciality was social anthropology. Douglas was considered a follower of Émile Durkheim and a proponent of structuralist analysis, with a strong interest in comparative religion. Aaron Wildavsky (May 31, 1930 – September 4, 1993) was an American political scientist known for his pioneering work in public policy, government budgeting, and risk management.